Versatile and durable, sized for light travel or to carry more every day, the leather version of our Classic Utility. CLASSIC MOLESKINE LINES: The Classic Utility Bag evokes the clean, elegant lines of the classic Moleskine notebook. Designed with your busy life in mind, it fits devices up to 15", and features a my Moleskine pocket so you can easily access your notebook. 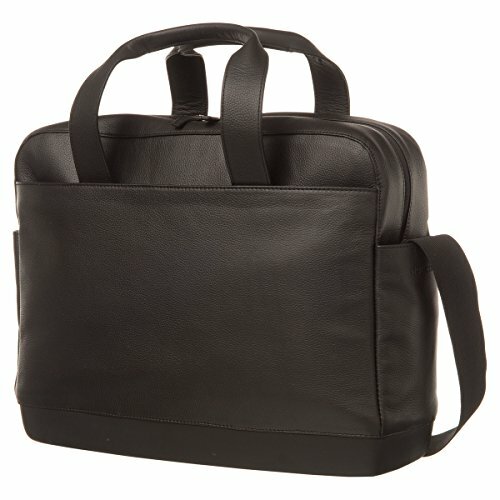 TRAVEL IN COMFORT: With padded device storage for a tablet or laptop, an organizer for cards and pens, and my Moleskine pocket, this bag effortlessly carries you through the day. Lightweight to keep you mobile, with adjustable straps designed for comfort. MOLESKINE VERSATILITY: In addition to the iconic notebook, the Moleskine family of products includes both digital & analog writing & lifestyle technology, including smart notebooks & apps, bags, notebooks, travel & digital accessories & writing tools. MOLESKINE QUALITY: Moleskine is dedicated to quality, culture, travel, memory, imagination, & personal identity--in both the physical & digital world. We bring this commitment to our notebooks, bags, apps & smart pens & notebooks. Crafted out of supple, yet durable 100% leather.